2007 Photograph, Wat Khong Chiam Spirit House, Khong Chiam, Khong Chiam District, Ubon Ratchathani, Thailand, © 2014. 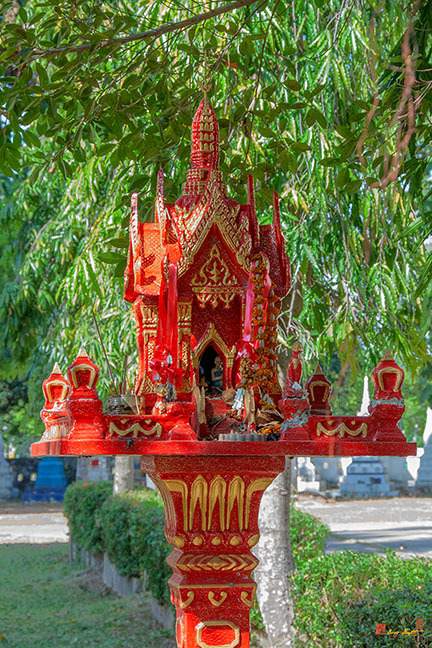 The animist religion that has its roots in pre-Buddhist Thailand is still strong in the country and it is quite common to see a spirit house on the grounds of a Buddhist temple. The spirit house is meant to provide a home to any spirits of the land that were displaced by the construction of the temple, home or commercial building. Daily offerings of food, flowers and incense are made to keep the spirits happy and to entreat them to benevolently protect their land and the people who live or work on it.